I love to decorate my home, but the budget sometimes hinders my creativity. I have become an avid Goodwill shopper. Nearly all the furniture and accessories in my home have been handed down or purchased second hand. If your willing to hunt for the treasures you're sure to find them. This past weekend I had a hour or so to kill while I waited to pick my daughter up from a birthday party. Since there was a goodwill store near by I knew I could fill the time searching for a great deal. Oh and did I find one. In the back there sat an incredible antique dresser screaming "you've got to take me home!" But as I approached I saw that it was too late, someone else had purchased it. I was disappointed, but when I turned around I forgot all about the sorrow felt in the seconds that just past. 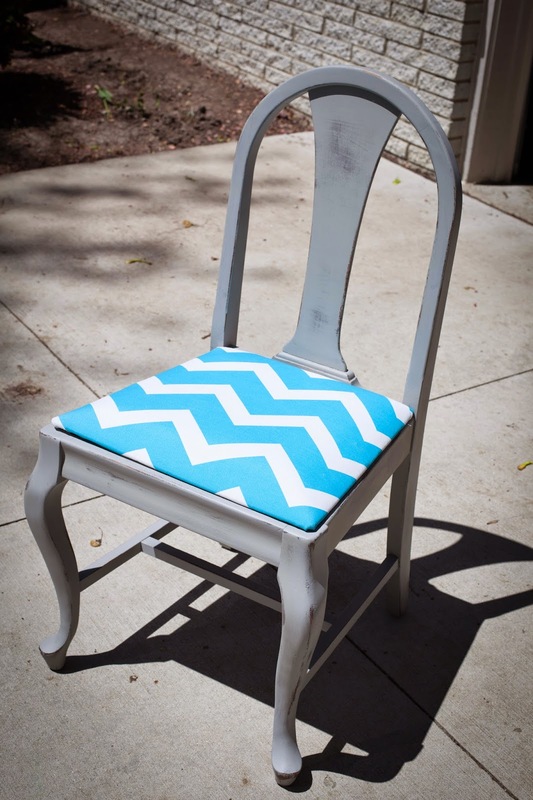 I thought with a little paint and some new fabric that little arm chair would be great in my living room. The creative wheels turning in my head. The chair was only $6.99. 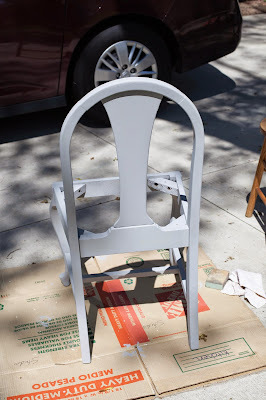 I was thinking this would be a great project to test out the homemade chalk paint, but I didn't have any gray (the color imagined my my new chair would be.) So I would have to buy some paint. I was going to have to purchase fabric to recover the seat, too. Usually this is where the $$ start adding up in my head and I shrug my shoulders and walk away from a deal. Sometimes a deal can cost more than my budget allows, and then it's not a deal anymore. My mom however saved the day. You see she is the one who passed the "you can make that old thing new again" gene. 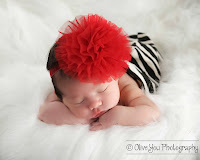 She has a way with finding gems in the most unlikely places, giving them a make over, and then finding them new home. For years she has hunted, sanded, painted, and renewed fabulous finds, and now she is teaming up with three other amazing women to open their own antique boutique called Simply Se-Lah in Louisburg, Kansas. When I had given up one my idea of this cute arm chair in my living room I sent her a photo of the chairs via text. She loved them, but they were in Wisconsin, not Kansas. 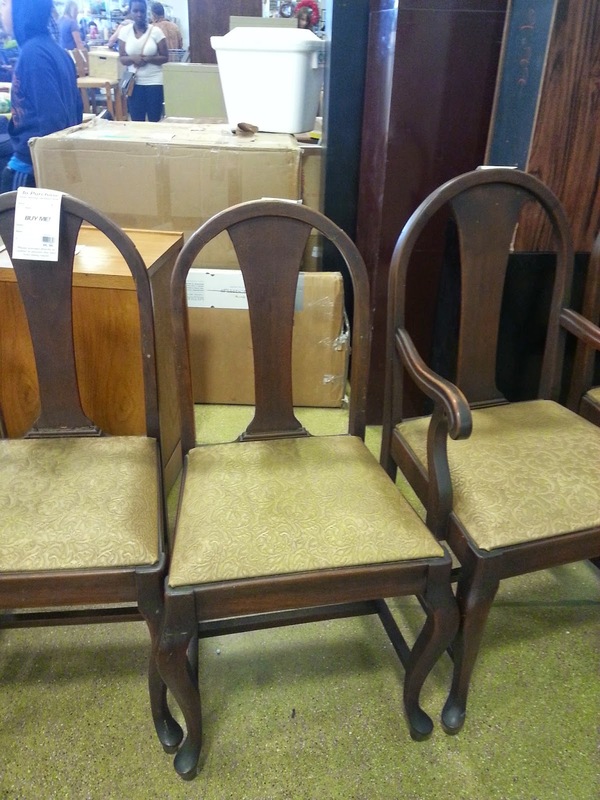 She suggested that I purchase all the chairs, redo all of them and sell the set of four. Genius Mom! Yes it would require some elbow grease and a lot of time, but in the end my chair would be better than free! 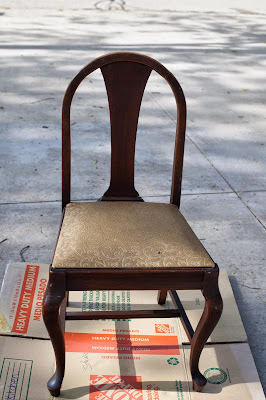 In case you are interested in unleashing the potential of adorable dining room chairs here's a little how to. 1. Remove the cushions from the chairs. For most you will only need a screw driver, but some may require the torque of a power drill. Then set them aside to recovering. 2. 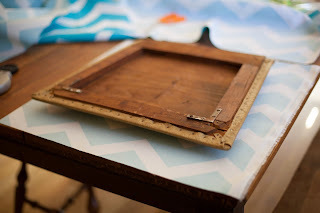 Mix up some chalk paint. 3. Paint the chairs. Chalk paint dries fast so by the time you are done painting your last chair you can move along to step 4. 4. 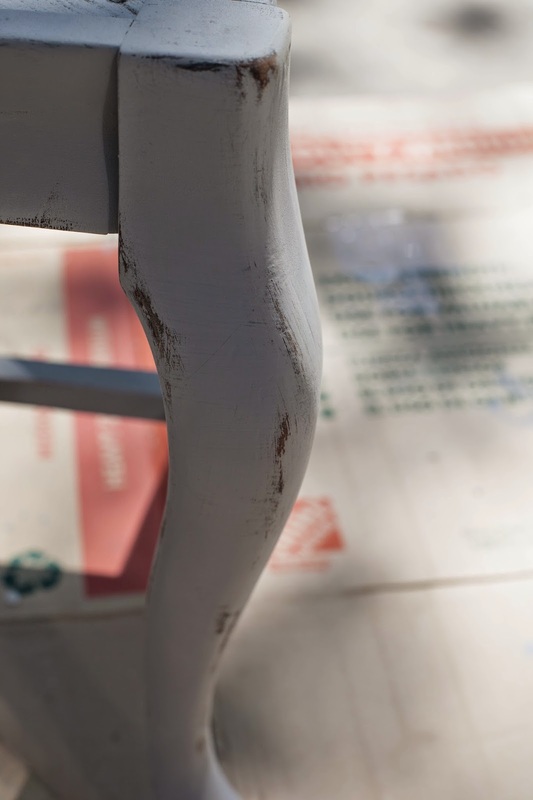 If you like the distressed look then use a fine grit sand paper to rub paint off the raised surfaces like edges and curves. If you don't like this look skip to step 5. 6. Buff chair with a soft cloth. 1. Choose a durable fabric. Upholstery fabric can be pricey but you can often get it 1/2 off at local stores like Jo Ann's. You will need to measure your cushion and make sure you have extra to go around the sides. Pay attention to the pattern of the fabric too you might want to get extra to make sure you can center the design. 2. Place your cushion on the fabric, double check your measurements, then cut. 3. Re center the cushion pulling the fabric tightly and staple once in the center of the front and back of the cushion. Turn over the cushion to confirm placement. 4. Continue pulling the fabric tight and stapling around the entire cushion. 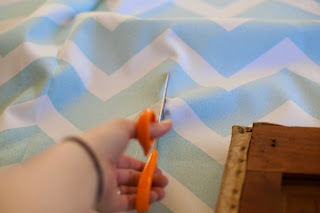 You will need to pleat the fabric at the corners. 5. 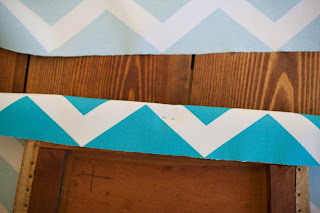 Trim excess fabric, especially around the screw holes. 6. Re attach the cushions to the chairs! I bet you can guess where I might spend that extra money!